Occasionally I look into the meaning of names. 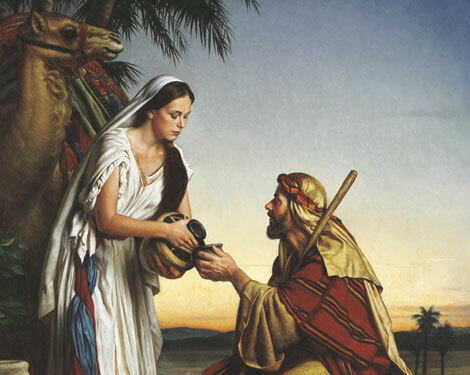 My name is taken from Genesis, its origins and namesake being the wife of Isaac, and mother of Jacob and Esau. It is a belief of Hebraic scholars that an individual who carries her name has a measure of her unique strength. In looking at Genesis, it is apparent that Rebekah had full complements of gifts and weaknesses. She was both obedient to the will of God, and enslaved by her own wishes: the dreams that she had for her future, her marriage, and her favored child Jacob. She was, in a word, scrappy. I am, in a word, scrappy. I, also, was drawn to my husband in an inexplicable spiritual way. The Lord honored that drawing by deeply binding us shortly after we began to date. Our identities and fates intertwined and we walked on, together. We were married within eight months of meeting, and I have never looked back. I have never regretted moving forward into marriage with a man whom others would say I barely knew. I have never doubted that our bond was God-created and God-blessed, and that bond has endured for the twenty years since we met, and I don’t doubt that it will endure, still, for the forty or fifty years that we have left together. But unlike Rebekah and Isaac, we have each become closer to God and more united with each year we have spent together. We have spent 18 of the last 20 years improving each other and our children through our unity. The first two years of our marriage was dicey, mostly due to the lingering effects of hurtful relationships I had experienced in the past, and my inability to cope with those hurts. Through the sage advice of my husband, I sought refuge and attitude-shaping through individual therapy. My therapist Alan was thoughtful, spiritual, and gave amazing insight into what grave hurts men are capable of; and what great healing I could allow in my self through the attention of my patient and loving husband. Together we have spent the last 18 years of our lives awake in our marriage, thoughtfully stepping through the landmines and oases of friendship, intimacy, parenting, spiritual development, Christian community, and personal relationships with our God. We have fought – hard – when ghosts of our pasts threatened our sense of security or purpose. We have spent many hours both organically growing our marriage, and seeking the wisdom of couples who have gone before us and navigated similar deep waters. Sometimes it has been very difficult; my scrappy nature and my husband’s quiet strength have been both a boon – and a detriment – in different scenarios. My fighting spirit has sometimes inhibited my ability to “sit on my hands”, mentally and spiritually, and that has caused some problems in our relationship. My husband’s patience has sometimes allowed for pauses – where there should have been action. But any time we have set aside our own individual wills, and subsumed our natural personalities in favor of where we felt God was leading our marriage, we consistently saw growth, change and increased strength in unity and purpose. I am very sure that God led me specifically to my husband, and intentionally to that therapist. I am very sure that God is leading us every day, further onward – and upward. I am very sure that God is not done with us yet, as individuals and as a couple. I am very much looking forward to see what God has in store for our marriage! He is always transforming darkness to light, divisiveness to unity – as much as we will allow Him to. “This House is Haunted”, by John Boyne (who also wrote “The Boy in the Striped Pajamas”), is a ghost story spun from the point of view of a stubborn, bookish governess, and is set in 1867. For some of you, that would be enough, you’d be off to order it from your local library or (gasp!) download it onto your Kindle. For the REST of you, for anyone who has read Dickens and his description of 19th-century England (and the clear-cut, sociological examinations of issues of class, gender, and opportunity – or lack thereof – ), or is entranced by the ghostly mystery of “Jane Eyre,” you will absolutely adore this book! The 21-year-old governess, Ms. Eliza Caine, is a sturdy woman. She is the only child of a sweet, educated entomologist whose admiration of Charles Dickens (who makes an appearance in the beginning chapters of the book) is childlike with delight. I can’t say a whole lot more without giving away key aspects of the plot, so I won’t.